Michiko Kakutani, author of "The Death of Truth." Someone taught you what you know. Or you taught yourself. You circled knowledge slowly, equivocally, or you pounced and never budged. You are willing to listen, or you're all done with that. You fight to be heard, or you fight to win. Whoever you are, you're living in an age of fake news, conspiracy theorists, and willful misrepresentations. 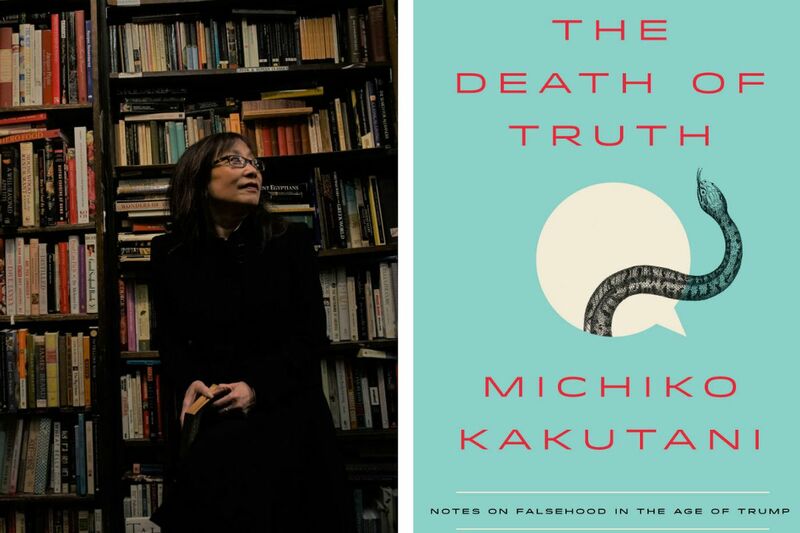 In her book The Death of Truth, Michiko Kakutani says this age is also shouldering "fake science (manufactured by climate change deniers and anti-vaxxers), fake history (promoted by Holocaust revisionists and white supremacists), fake Americans on Facebook (created by Russian trolls), and fake followers and 'likes' on social media (generated by bots)." You're living in a time that writers such as Hannah Arendt, George Orwell, and David Foster Wallace augured. A time to which history holds a mirror — think Lenin, Mussolini, and Hitler. A time that might be a slightly different time had not postmodernism and deconstruction taken hold of our imagination and vocabularies. Deconstruction, in fact, is deeply nihilistic, implying that the efforts of journalists and historians — to ascertain the best available truths through the careful gathering and weighing of evidence — are futile. It suggests that reason is an outdated value, that language is not a tool for communication but an unstable and deceptive interface that is constantly subverting itself. Trump's ridiculousness, his narcissistic ability to make everything about himself, the outrageousness of his lies, and the profundity of his ignorance can easily distract attention from the more lasting implications of his story: how easily Republicans in Congress enabled him, undermining the whole concept of checks and balances set in place by the founders; how a third of the country passively accepted his assaults on the Constitution; how easily Russian disinformation took root in a culture where the teaching of history and civics had seriously atrophied." Divided into nine short chapters with such titles as "The Vanishing of Reality" and "Filters, Silos, and Tribes," Truth is laser-focused, smart, and emotionally claustrophobic. Readers will have to remember to breathe, and they won't be rewarded for flipping ahead to the final pages in search of optimism. Our forefathers are there, at the end, as are the "inspiring students" of Parkland, Fla. But mostly we're left on our own in a constitutionally desolated landscape. Yet Truth will be read in the wake of Alexandria Ocasio-Cortez's successful "Courage to Change" campaign. It will be read in the aftermath of a march during which hundreds of thousands of Americans in more than 700 communities showed up together in sweltering weather on behalf of the incarcerated children and broken-hearted parents on our Southern border. It will be read when people of all political stripes are grasping for reasons to hope. We have been battered by lies in our politics, literature, and national discourse. We have been suffocated by silos, fractured by walls, done in by our social media and shallow attention spans. We are often not, it is true, listening to one another, and Kakutani makes an excellent case. But how much stronger Truth would have been had Kakutani also turned the bright light of her immense learning and intellect toward those places where — despite the terrible noise of fake news, fake science, bots, and trolls — politically diverse people continue to listen, not so they hear what they want to hear, but so others might be heard. Beth Kephart is author of 22 books, most recently "Wild Blues." Her books on truth include Handling the Truth: On the Writing of Memoir and Tell the Truth. Make It Matter. Contact her at bethkephartbooks.com.